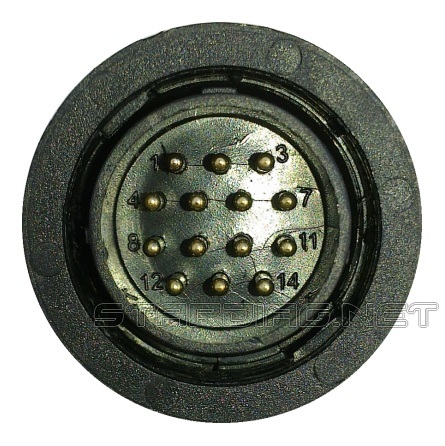 Cable 14 pin for multiplexer Mercedes Star Diagnosis C3. Mercedes Star Diagnosis C4 (SD Connect C4). Full upgrade (S/N, shutdown, error batteries). Dealer diagnostic scanner Mercedes. Mercedes Star Diagnosis SDConnect C4 in C5 housing. Full upgrade + Active cooling. Star Diagnosis C3 main unit. Part D. Without cables. 8 to 36 V.
Module connector of SD Connect C4. Star Diagnosis C4 pcb board connectors. Star Diagnosis C4 (SD Connect) with a Laptop. Full upgrade. Diagnostic system Mercedes SDConnect C4. PIC16lf88-I/SS SSOP-20. SDConnect C4 Security PIC. Microcontroller PIC series. Mercedes Star Diagnosis C3 (MB Star C3). Scanner dealer Mercedes. Mercedes SDConnect C4 display Board pcb. Display module SD Connect C4.